Trade Minister Paula Gopee-Scoon; Ashmeer Mohammed, chairman of Export TT; Dietrich Guichard, CEO of Export TT; Dionne McNicol-Stephenson; Camille Selvon-Abrahams, UTT project co-ordinator (Animation); Nneka Luke, general manger Film TT; Deborah Hoyte, co-ordinator Export TT; and participants Mathew Hudson, Michael Richards, Kevin Bhall, Andy Berahazar, Jeunanne Alkins, Jason Lindsay and Jessica Yawching. 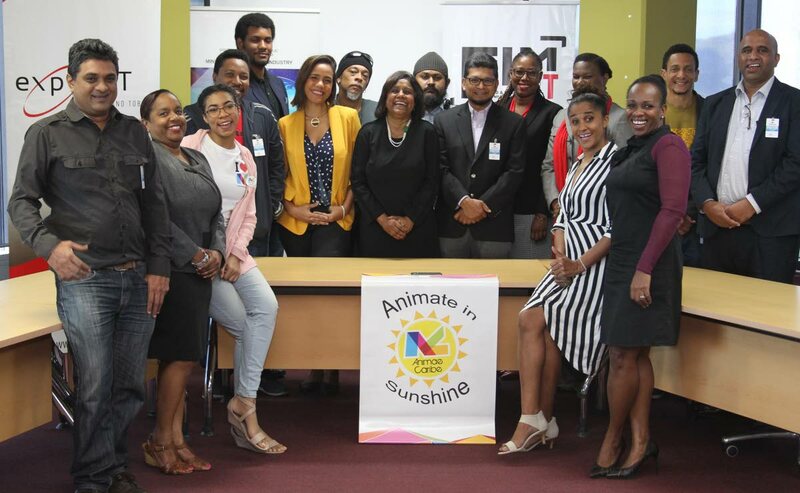 LOCAL animators and members of the creative industry will have opportunities to present their works to the world, Animae Caribe founder Camille Selvon-Abrahams believes as she leads a team to Miami for a summit. A TT delegation will take eight features to the 2019 Kidscreeen Animation summit – February 11-14 – but special focus is being placed on four of these animated works. Selvon-Abrahams shared this to the media during a news conference at the Trade and Industry Ministry's offices at Nicholas Towers, Port of Spain, last Friday. They four presentations will be by Jeuanne Alkins, Michael Richards, Jason Lindsay and Jessica Yaw Ching. Their offerings are Bim and Bam, Birds of a Feather, DIY Zoe and Magnificent Maggie, respectively. Bim and Bam focuses on curious six-year-old twins who get caught up in ridiculous adventures while on vacation with their family. Birds of a Feather is the tale of Clyde, a former racing pigeon, whose girlfriend is kidnapped by a wild meat vendor. Through these animated products, Selvon-Abrahams said Animae Caribe will be offering animation with a distinct TT and Caribbean flavour. These works will showcase aspects of local and regional culture, music and the arts. They will also give attendees a glimpse into TT's education system. "We are also taking the possibility of outsourcing," she said. Intellectual property will also be a focus of Animae Caribe. "We really don't know what to expect in Miami," Selvon-Abrahams said, as the delegation's participation is about testing the waters. Paula Gopee-Scoon, Minister of Trade and Industry with Dionne McNicol-Stephenson; Camille Selvon-Abrahams, UTT project co-ordinator (Animation); and Nneka Luke, general manger Film TT, at the media conference hosted by Gopee-Scoon, Export TT and other stakeholders in support of the animation segment of the local film industry. However, she said, the next phases for Anime Caribe will be about development and commercialisation. Selvon-Abrahams thanked the collaboration which Animae Caribe has had with the ministry, FilmTT and ExporTT. With the global animation industry estimated to grow from US$259 billion, in 2018, to US$270 billion, by 2020, Gopee-Scoon said Government sees opportunities for TT and will “take the necessary steps to successfully capture market share.” She explained this is in keeping with the national development strategy’s pillar on building globally competitive business. The minister said Walt Disney, IMAX and Sony are constantly searching for locations that provide a suitable environment to outsource animation services. Major animation studios, such as EA Games and DreamWorks, are also pursuing global outsourcing as part of their business model. She said while shows like The Simpsons and Futurama were conceived in the US, they were “brought to life overseas”. She opined that TT has resources to provide a location for these companies. 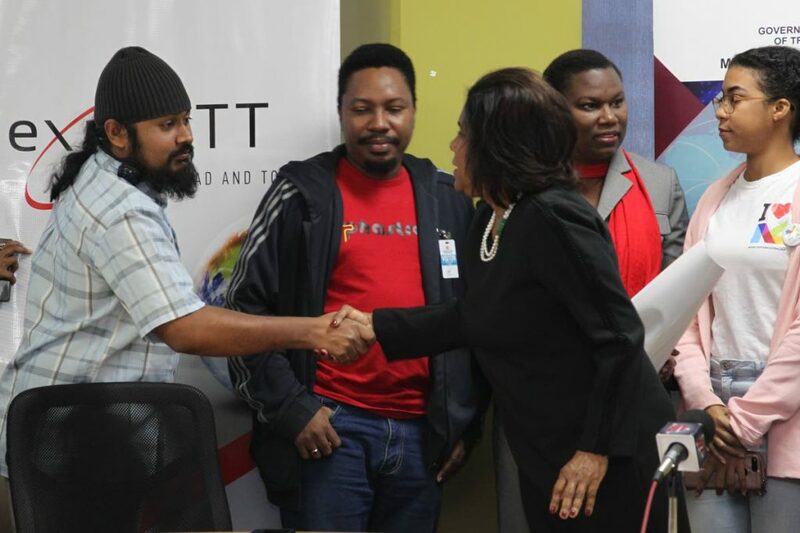 Trade Minister Paula Gopee-Scoon greets film producer Kevin Bhall, along with Michael Richards; Roxanne Colthrust; director of Anime Caribe; and Jessica Yawching. These include being cost-friendly, having a knowledgeable workforce, being fluent in English and having a high-tech animation infrastructure. On the home front, Gopee-Scoon said Full Circle Animation Studio has produced work for Universal Studios and Disney. She said Full Circle has recently been recruited by Big Jump Entertainment in Canada to produce the animation for season three of Animals. Gopee-Scoon observed, "Full Circle has evolved into a foreign exchange-earner given its expanding overseas clientele." She was confident other animation studios will follow its lead. Kidscreen Summit is regarded as the children entertainment industry’s most important annual event and an estimated 2,000 animators from over 50 countries are expected to attend. Reply to "TT animation for Miami summit"